Magma is a prime example of how Gojira successfully navigate the line between high art and theme park thrill ride. Nearly every band extant wants you to believe that their latest album is their best to date, an upwardly mobile trajectory of musical aspiration endlessly surpassing itself in achievement, but very few bands pull it off as consistently and as comprehensively as French progressive metal ensemble Gojira. Hell, they don't even need to brag on themselves to do it, an "action speaks louder" ethos that many of their brethren could stand to take to heart. 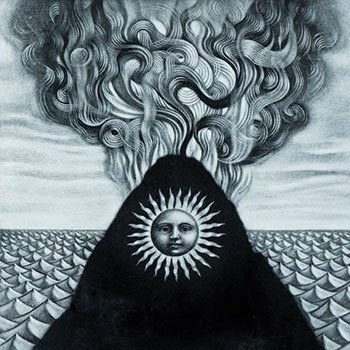 Magma comes a good four years removed from Gojira’s previous effort, L’Enfant Sauvage, but audibly picks up right about where that album left off: string-bending grooves, squawling cliffhanger riffs and a snappy sense of melodic economy. Vocalist Joe Duplantier reaches more than ever for a clean, declarative delivery on tracks like “The Shooting Star” and “Magma”, while the chorus of “Stranded” even dabbles a bit in the throaty, anthemic sing-along quality of 1990s industrial metal (the sheet metal caterwaul of the guitar stinger has to be heard to be believed; the band apparently love it so much they recycle it four songs later for “Only Pain”). The abiding characteristic of Gojira is not their technicality or instrumental prowess -- though the band is frequently beloved by fans of other itinerant time signature enthusiasts such as Meshuggah, Animals as Leaders and others of the “djent” set -- but rather their knack for earworm riffs. Magma bears no shortage of infectious guitar work, and “The Cell” is the best of the bunch, a quick three minute romp that vacillates between fleet-fingered triplets matching a subtle blast beat and a time-stretched sludge wallop drop-tuned nearly into oblivion. It’s a prime example of how Gojira successfully navigate the line between high art and theme park thrill ride. The second half of the album takes a plaintive, melancholy turn starting with the title track and running through “Pray” and “Low Lands”, all three fairly mid-paced numbers with meditative lyrics and Duplantier’s voice reflecting an untethered sense of yearning, if not outright mourning. “Liberation” ends the album on an odd folk note, a barely audible acoustic guitar strumming out a gothic noir like a shyer version of Ry Cooder. There has been many a “who’s gonna fill their shoes?” thinkpiece on which, if any, of the current crop of metal bands has the capability of becoming the next Metallica, i.e. universally held in lofty regard, still moving an impressive number of units even in the midst of a withering record industry and, most importantly, able to fill 10,000-seaters on their own without the benefit of an extravagant, all-day festival built around them for support. Gojira don’t so much stake a claim for themselves as that next level band these thinkpiece authors seek so much as undermine the relevancy of the question to begin with; the strength of the modern metal scene lies precisely in its restless, fragmentary nature, a bit of “something for everyone” that covers every possible niche demand but, in doing so, hamstrings the kind of consensus agreement that heavy metal groups of the 1980s and 1990s enjoyed: a consensus frankly built more on limited selection and stifled risk than any inherent supremacy of that era’s artists. Gojira may not appeal to everyone, but they appeal to about as many fans as possible while still flying their own banner and chasing no trends. Magma hardly represents the epitome of the avant-garde in today’s metal scene, but in offering a concise anthology of accessible, immediately engaging songs that nonetheless manage to redefine the edge of the commercial envelope, Gojira set the bar for what arena metal could be five years from now, ten years from now… whenever the more casual heavy metal demographic finally catches up. After all, Rome wasn’t built in a day, and neither was Metallica.